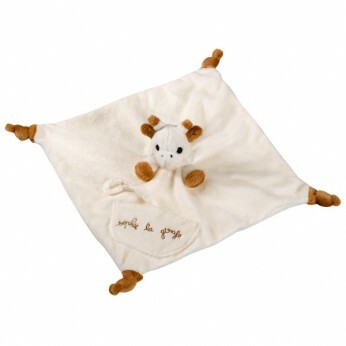 Sophie the Giraffe Comforter with Soother Holder is ideal for baby to cuddle up with! Soft and plush, this large comforter will provide reassurance and comfort for baby. Baby will love teething on the 4 knots, one in each corner. Sophie the Giraffe practical comforter comes complete with a velcro fastener to hold baby’s soother and a little pocket to pop the soother in when not in use. This toy costs approximately £12.99 (for the latest and best prices make sure you check our retailer list for the Sophie the Giraffe Comforter with Soother Holder above). In our review of Sophie the Giraffe Comforter with Soother Holder we classed it as being suitable for ages 0 to 11 months but recommend you check the manufacturer specific advice before purchasing.